The world is at a critical juncture in its response to the worst Ebola outbreak in history, currently causing unprecedented death and upending communities and economies in West Africa. Countries and organizations are ramping up their commitments to help bring the crisis under control, but it has become clear that the situation will continue to worsen until a fully orchestrated response is in place. 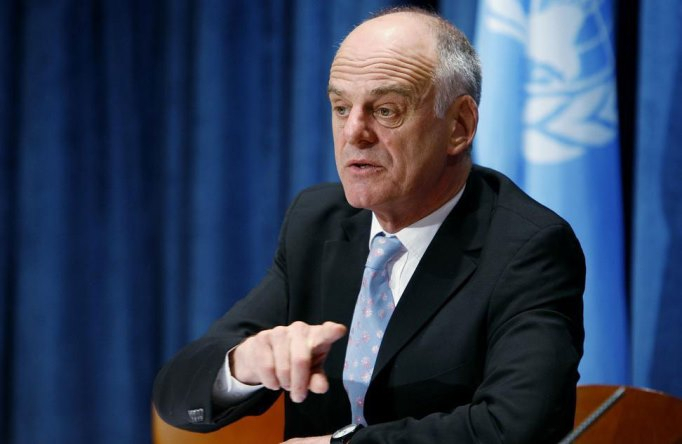 Last month the United Nations Secretary-General appointed Dr. David Nabarro as Senior United Nations System Coordinator for Ebola Virus Disease. I asked Dr. Nabarro to provide his perspective on a number of questions that are on the top of my mind. What do the next few months look like for countries dealing with this Ebola outbreak, and how confident are you that we will ultimately be able to stop the spread and end this outbreak? The outbreak will get worse before it gets better, and there will be more lives lost. But we are ramping up treatment capacity rapidly, which includes purchasing and delivering protective clothing, medicines and equipment to the places that need them most, as well as ensuring that the health workers on the front lines get paid. We will contain this outbreak. What are the biggest challenges that we face in combatting this particular outbreak of Ebola, which is the worst in history? What are the specific challenges that the UN faces? Nobody anticipated the speed of the spread of this outbreak, and the countries coming out of war and civil strife a decade ago had not yet built up their health systems to cope with such an outbreak. Government health workers have responded with courage. Foreign medical groups — including from countries where people have been affected by Ebola Virus Disease — have helped. Some international organizations — notably Medecins Sans Frontieres — have provided extensive assistance through well-run Ebola Treatment Centers. As the outbreak has extended, the UN system is now mobilizing people and finance to help people to tackle the disease and to cope with its multiple consequences, to strengthen capacity to manage the isolation and treatment necessary, and to revitalize health services to tackle not just Ebola but also for other diseases that present similar symptoms. A strong response, coupled with excellent exit screening for departing air and sea passengers, should contribute to resumption of services by airlines and shipping companies. In the meantime, alternative air-bridges will be established. Affected countries seek all possible support — including relevant military expertise — to help contain the outbreak and mitigate its consequences. As UN Special Envoy for Malaria, I am especially concerned about the negative consequences of Ebola for other diseases that present with similar symptoms, like malaria. What can be done to ensure that those who are sick with other illnesses still get the treatment they need? This is a huge risk. The high incidence of Ebola Virus Disease has the potential to impact many more peoples’ health besides those who are actually infected with the virus. There will be an increase in levels of illness and fatality associated with many conditions, not just Ebola. One way of dealing with malaria, if WHO and the countries agree, is to treat all fevers as though they are malaria. Once that is done malaria can no longer “mask” Ebola. This would be in conjunction with widespread distribution of long-lasting insecticide-treated mosquito nets. This temporary measure would be discontinued when the transmission of Ebola Virus Disease is stopped: it can be effective, especially as the malaria season within the three countries is imminent. The World Bank recently pledged as much as $200 million in emergency funding to contain the spread of Ebola infections, help communities cope with the economic impact, and improve public health systems throughout West Africa. Is there adequate funding available to address the overall Ebola situation, and if not, how will we identify and secure the financing needed? There is not sufficient funding right now. The WHO initially requested just under $500 million for the health sector. More is needed to address other consequences of the outbreak including poverty, food insecurity, protection and the costs of supporting the response. With the scale of the outbreak increasing exponentially, additional support will inevitably be needed unless it is rapidly contained and then controlled. Addressing the Ebola outbreak means addressing the fragile state of many African health systems. How can our response now help to strengthen those systems and prevent again future devastations from Ebola and other diseases? The first order of business is the systematic and orderly control of this outbreak. This will require training of many health workers and first responders at different levels and a rigorous system for ensuring infection prevention and control. This capacity can be the legacy of the outbreak so that the future response can be both quicker and more effective. The capacity will lead to the rapid upgrading of health systems through training, medicine distribution, logistics and case management.